Uhuras dictation was interrupted by the lurch of the Hyperion unexpectedly dropping to sublight speed. She turned to the helm. "Marsden?" "Warp drive cut out, Captain," Marsden replied, wincing. "Again." Before Uhura could turn to her chief communications officer, TSoral announced, "Connecting with Engineering, Captain." "Running Bear, Id like to talk to Indri if hes free." As much as Indri considered the Native American engineer his alter ego in Engineering, Uhura was more interested in Indris opinion. There was a brief pause before Running Bear answered. "Um, Indris indisposed, Captain. Hes hanging by his knees, head down in an access port, with an ensign sitting on each of his shins to keep him from falling into the puddle of fluid on the floor under the access. Apparently, someone jury-rigged a circuit board with a component that couldnt handle the load, so they ran coolant to it. From what I could tell from Indris comments, the tube carrying the coolant split, spraying coolant everywhere." Uhura shook her head. "Wonderful. Do you have any idea how soon it will be before warp drive is functioning again?" " Running Bears reply was interrupted by a loud squawk, followed by Indris voice shouting orders, an assortment of horrendous maledictions on Space Dock repair personnel who were experts at hiding their incompetence and a demand for protective face shield. "Id say that the situation has changed very significantly, and no estimate I could offer would be worth hearing. With your permission, Captain, I think I need to assist Indri." "It sounds like it," Uhura sighed in resignation. "Bridge out." The captain turned to the helm. "Marsden, recompute to arrive at as close to on time as possible factoring in a four hour delay." She paused briefly and reconsidered. "Better compute it for an eight hour delay, too." "Aye aye, Captain," Marsden returned. "Should I figure it for a twelve hour delay, too, just in case?" Uhura thought for a moment. "Well, as long as it doesnt require anything faster than Warp Eight. We could do with a little time to practice using the remotes." Several hoursand two more episodes of dropping out of warp drive due to a malfunction in a critical control arealater, the Hyperion arrived in position to oversee the cadets practice maneuvers. The turbolift door opened, letting Uhura, Drevan, Reichard and Tucker exit, mid-conversation. "Theyve really done a good job, Captain," Drevan enthused. "To tell that the ships dont really contain Klingons, you have to do a detailed, long-term scan and see that no one is moving in the ships. Im telling you, the cadets are going to go crazy with this setup." "I hope, Drevan, that the setup doesnt drive those of us who have to use it equally crazy." Uhura moved toward the circle of readouts and controls in the middle of the room. "Which seats mine, Indri?" "That one." Indri pointed to the seat next to where he was standing. "We reserved the largest battlecruiser for you, Captain. The rest of you sit where you wish." As Indri spoke, the turbolift door opened again, letting Running Bear join them. "You get whats left, Running Bear. Thats what you get for arriving last." "Fine by me, Boss." The tallish, thin Native American planted himself in the only remaining chair. Before him, as with the others, there was a pair of joysticks and a large screen. On the floor, there were a pair of pedals. Indri moved to the middle of the rough circle. "The pedals control forward velocity. Step on the right one, and impulse will move you forward; the harder you stomp, the faster you go. Left pedal will stop you; the harder you stomp, the harsher the deceleration. Right joystick controls the ships position; pitch is controlled by moving to and fro; yaw, by moving right or left; roll by twisting around the axis. Left joystick moves the targeting box; the little knob on top controls the target lasers. The screen in front of you should be totally obvious. Upper right hand corner is your Cartesian coordinates, relative to the center of the combat zone. Upper left, the number of times youve hit someone, and the number of times youve been hit. Center screen is whatever is right in front of you; youve got above, below, right, left and behind, as marked. Any questions?" Reichard grinned. "Yeah! Any chance we could get the Hyperion rigged to be run with this system?" "Only if you can set up as many sensors as weve got watching this volume of space, everywhere you go." Indri looked at the others. No one seemed to have any other questions. "Good enough. You folks have about three hours before the first ship of cadets arrives. Practice all you want for an hour or two, and plan strategy when you get used to it. Im off to see if I can fix the mess Space Dock made of the Hyperions engines. Try not to break your new toys, will you? Spare parts for Klingon ships are hard to come by." Indri disappeared into the turbolift. The individuals in the room rapidly became engrossed in trying out the controls, targeting and being targeted, chasing each other all through the designated zone. To Uhura, it seemed that only minutes had passed before the practice session came to its end. She looked around at the others. "We seem to have the hang of it, well enough. Especially you, Tucker. Did anyone mention that youre utterly bloodthirsty?" Tucker stood up and bowed. "To a weapons officer, Captain, thats high praise. Thank you!" The others chuckled. Reichard joined the conversation. "Listen, the cadets know that there will be Klingon ships here to shoot, but Im hopeful that theyve no idea how many of them there are. What say we hide a couple of them behind something? Let them think that therere only three ships, then when the shooting gets intense, ambush the cadets with the two hidden ships?" "Im with you!" It was clear that Drevan loved the idea. The Andorian turned to face Tucker. "Id say hide yours and mine, Joeours are the smallest. With Uhuras visible, theyll figure that we intended its sheer size be what makes the odds even. I think I know the path they should be coming along, which will tell us where to go to be invisible." "That assumes that the cadets wont overshoot and have to come back." Uhura obviously had no delusions about the cadets and their navigational skills. "Not a problem, Capn," Reichard responded. "There will be a seasoned officer at the helm and overseeing Engineering. The cadets wont get control of the ship until theyre here, the phasers are disconnected and the warp drives deactivated. Theyll be on time, on course." "Excellent." Uhura stood up. "Drevan, Tucker, hide your ships. Running Bear, Reichard, Ive put my ship near the center of the field for the exercise; you two take flanking positions as you see fit. Then lets hit the mess hall and plan strategy a little more." The fivesome commandeered a table in a quiet corner of the mess hall, trays laden with food before them. Drevan grabbed a napkin and a pen, sketching quickly. "Now, this is roughly how I remember our ships being laid out in the exercise area. Two of us behind this larger asteroid, Uhuras ship here, Running Bears and Reichards here. Look about right?" Reichard nodded. "Good enough for discussion, anyhow. Whatre you thinking?" "Well, these three are in a nice, sharp formation, as if they were really manned." Drevan pointed out. "Seems to me that if the cadets dont know weve got em wired to act, theres no reason to tip our hand early. Now, if we left them in about the same position, but with randomized attitudes, theyre going to look a lot more like derelicts just towed into place an dumped for target practice." "Offer them a little sucker bait, eh?" Tucker asked. "I like it. Then we can all sit on our hands, letting them take potshots at us for a while, waiting for them to get a little cocky. Once they look like they think theyre shooting defenseless fish swimming in a barrel, we turn on them." Uhura nodded. "I like it. Any other refinements?" After a few moments of nothing much being said, Running Bear entered the conversation. "It would seem to me logical to expect the cadets to pick on Uhuras ship first; its the biggest target, and thus hardest for them to miss." There was a chorus of agreement. "Good enough. We want to teach these greenies to think ahead, and to watch their backs, no matter where their phasers are pointed. So, let them pick on Uhuras ship for a little while. Then once theyre fixated on her ship, Reichard and I land on em. If we move our two ships a little further back, the cadets might just be dumb enough to get themselves between Uhuras ships and ours." An almost fiendish cackle exited from Uhura. "I can see where youre taking this, Running Bear. You and Reichard start zapping them, and they turn their backs on me, at which point I light into them when theyre not expecting it." The Native American nodded vigorously. "Stir this one into the mix: while Reichard and I are taking them on, he and I move down and away from Drevan and Tucker, but more or less toward each other. Your starting to fire is ambush number two." Running Bear snatched cups and utensils from the trays, moving them to demonstrate. "My plate can be the asteroid. Drevan and Tucker move like this..." Two cups shifted position. "That lures the cadets into this void that is being created." Forks shifted position representing the cadets. An empty bowl moved into service. "This is you, Captain. They turn on us. You move like this..." The bowl left the table, moving above the forks representing the cadets. "We move downward. When you start shooting, what do you guess what the cadetsll do?" "Theyll fan out, oriented toward one of the three of you folks," Drevan interjected, clearly excited. "That makes them one beautiful, almost defenseless target. Thatll teach em to think three dimensionally." "Quit drooling, and let Running Bear finish his idea," Uhura ordered, increasingly captivated by the plan. "Youre right on target, Drevan. Thats when you and Tucker come out from behind the asteroid, shooting like mad. My bet is that theyll be so focused on the three of us, they wont know youre there until youve beaten them to bits." "Marvelous, utterly marvelous," Tucker said. "Even better, if we play things just right, while theyre confused by Drevan and I showing up out of nowhere, you three can move into position, and we can surround them, like this." The weapons officer began moving cups and bowls and all rapidly, demonstrating the idea as best he could. "Talk about easy meat, this is almost too good." "Youre all bloodthirsty, did you know that?" It was Uhura speaking. "Im just glad that Ive got you guys on my side. I think weve got it just the way we want it. Good work!" The scout ship was small, swift and cloaked, which was why no one noticed its arrival among the other Klingon ships in the volume of space laid out for the training exercise. Only four Klingons manned it; their mission had been one of clandestine observation, completed successfully and returning to their commander carrying data on Federation deployment. "Dravag," snapped Lieutenant Turak, commander of the small crew, "I thought you knew how to navigate. We should still be some distance from the borders of Klingon space." "We are. Ive double checked our location. Its those battlecruisers that are out of place, not us." "Turak, Dravag, quit jumping to conclusions, will you?" Ensign Gardang shook his head. "Weve been out of communication with High Command long enough for a strike force mission to have been planned. Its not like these are empty hulks, you know; theyre all manned with full battle crew. I say we contact the lead ship and find out whats going on." "Should we hail them?" asked Dravag. "No. This deep in Federation space, they would be in a total communications blackout. If we were to signal them and risk calling attention to their attack group, their commanders might retaliate against us." "Well, Im with Gardang," Ensign Vakos asserted. "Im dying for a huge bowl of fresh gagh, anyhow." "Gagh? Rokeg bloodpie for me. Ive been dreaming about bloodpies." Lieutenant Turak drooled. Vakos shook his head. "We waste time. My recommendation is that we move in quietly and dock. Gardang is right; this deep in Federation space, theyre probably here on a secret mission." "Head for the largest ship; its probably the flagship." Turak said. "We will dock with the ship, then board her and report to its commander. Cloaked as we are, their sensors probably cant detect us either." Without comment, Dravag maneuvered the small ship toward the cruiser, docking it. Turak moved toward the hatch. "Hold it, Turak," Vakos looked up from the console. "The atmosphere out there isnt breathable. What looked like a Klingon crew hasnt moved since we first sighted the ships. I think this may be a group of derelicts." "A strike force of derelicts?" Turak moved to a locker. "We suit up, and bring it back to QonoS if we can get it running. The ship must have power, or we could never have docked." The other three Klingons moved in obedience, donning life support suits and entering the ship. "Dravag, Vakos, check the engineering deck. Gardang and I will explore the bridge. Report there when you have assessed the engines." Turak and Gardang entered the bridge, the remote control system catching their attention the minute they arrived. Gardang leered happily. "Derelicts, Turak, but ones gutted and automated to be used for combat practice by Starfleet cadets. Looking at this bridge, Id guess D-2 and D-3 cruisers the Federation captured decades ago, probably at the battle of Donatu Five. With a little time, I think we may be able to give them more than they bargained for." Turak nodded. As he did, Dravag and Vakos joined them on the bridge. "The old R-5 Graf unit engines are gone, Captain," Vakos reported. "Sublight drive only. Looks like the disruptors are disconnected, with targeting lasers replacing them." "Can you reconnect the disruptors and torpedoes without bothering the targeting lasers?" "Easily, Lieutenant. Itll take twice, perhaps three times as long to recharge them for firing, but theyll work fine." Turak turned to Gardang. "You can take control back from this box?" "I can set it up so we can take over on your command, Turak." The Klingon smiled. "Good. Then see to it. And Dravag, see what you can do about getting life support running up to grade. This suit is starting to stink." "No problem, Captain. Gagh and bloodpies may be out of the question, but fresh air should be easy." All four Klingons laughed, then moved to bring the ship to battle readiness. Uhura exited the turbolift and settled into the command chair. The practice and planning of the day before had turned out well, although it had a surprise or two. Running Bear had been the big surprise, with his aggressive sequence of ambushes. The captain shook her head; she made a mental note to see if he had had any strategic training or not. At least what theyd managed to block out what seemed to be a worthwhile approach to teaching the cadets to be wary, perhaps even a little about how to survive combat. She reached to trigger the captains log. Before she could, TSorals voice interrupted her. 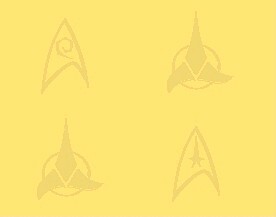 "Signal from one of the cadets ships, Captain. You may want to look at this." "On screen, TSoral." Uhura caught her breath. As the overhead communicator began speaking, a familiar ship came into view on the screen. "Captain Dimetrius Aiglekdos, of the NCC-1701-A, Captain Uhura. Request for medical assistance." As he spoke, the captains face filled the screen. It was clear that he was near, if not past, retirement; his hair was almost as white as Drevans, and his face was deeply lined. Despite his obvious age, there was no question that an alert mind lurked behind the steel blue eyes. "I assume you recognize this fair vessel?" Uhura smiled widely. "How could I forget her? Its good to see the Enterprise is still active, even if shes been shifted down into the training fleet. Whats the problem?" "Our chief engineer, Im afraid. He wasnt watching where he was stepping and went down the stairs the hard way. Broken hip at the least. Request permission to transfer him on the shuttle Ithaca." "Send him over. How soon do you estimate arrival?" "Ten minutes, maximum, Captain. One other little issue: could you spare us an experienced engineer to ride herd on this crop of cadets? Preferably one familiar with ships of this class?" "I think we can manage that, Captain Aiglekdos. Therell be one ready to return with the Ithaca. Is there anything else I can do for you?" Aiglekdos attempted a look of innocence. "Could you offer us mercy during the scoring of this little jaunt?" "Youll get all the mercy a Klingon would offer, Captain. Happy hunting to you and your cadets." The connection broke. "TSoral, have Sickbay get a litter and staff up to the shuttle bay. And have Running Bear report there, too." "Marsden, you have the conn. Im going to the shuttle bay." Uhura arrived at the shuttle bay control deck while Running Bear was overseeing the Ithacas final approach. MBenga and Webb were standing by with a litter to convey the injured engineer to Sickbay. Smoothly, the Ithaca touched down. All four moved into the bay as the door to the shuttle slowly deployed. Two cadets slowly made their way down the steps of the shuttle, bearing a stretcher carrying another individual. Doctor and nurse descended on them swiftly. "Oh, for pitys sake, its a small universe, isnt it? Hey, Doc! Good seeing you again! Forgive me if I dont stand up, old man." MBenga looked at the face of the wounded engineer and shook his head. "Frensa?" "At your service, Doc. Or maybe at your mercy. Been a few years, hasnt it?" Frensa smiled the best he could. MBengas hypospray hissed, delivering something for the pain. "Quite a few, Mike." The chief medical officer deployed his scanner. "Femurs in about three pieces. Youre going to be with us for a while. At least three or four days, I think." "Drat. I was hoping to harass some cadets." Running Bear moved into the discussion. "I take it youve set up shop in Scottys old office?" "Best place for it! Its rigged so I can cause all kinds of fake mayhem for them to have to handle." "Ill be replacing you, Mike," Running Bear returned, ignoring the nurses remark. "Anything particular you had in mind?" "I left a written plan of harassment on the desk there. Do whatever you wantexcept whats on it. The engineering chiefs on the other four ships are all just barely out of their cadet training, and the captains are all superannuated, almost retired from Starfleet, or else desk jockeys pulled from the Academy. Youre probably the best man out there. I expect to hear horror stories about you, man, absolute, gut-wrenching horror stories. Dont disappoint me." "Before you go, Running Bear," Uhura interjected, "who do you suggest should take your place at the helm of your battlecruiser?" "Eletto would be a good bet, Captain. He helped with the controlstried em out for us while Indri and I were setting them up. We figured if a total greenie like him could handle em, anyone could. He wasnt half bad." Running Bear turned to face MBenga. "What do you think, Doctor MBenga?" MBenga shrugged. "Marie, think I can get along without Eletto?" Webbs face made it clear that Sickbay was hardly busy. She flicked her head, tossing her long, brown hair back over her shoulder. "I think we can handle Frensas femur without Doctor Eletto. Why dont we send him to practice with the controls when we get back." The turbolift door slid open. Running Bear ducked into the Ithaca. As the hatch closed, the rest of the folks made their way out of the shuttle bay and the Ithaca gently made its way home. Drevan, Uhura, Reichard, Tucker and Eletto took their places at the controls for their respective ships. Uhura looked at her comrades. "Okay, gentlebeings. The plans still the same. Hang dead in space until the cadets have started taking potshots and look like theyre getting overconfident. The expectation is that theyll try to close on my ship, since its the largest. Eletto, Reichard, thats when you start shooting back. When they turn on you two, Ill give em what for. Well maneuver them so that their back is to Tucker and Drevan; thats when you two pop up and sic em. Still for it?" "If that doesnt push them over the line into chaos, Capn, not much of anything will." Reichard was clearly relishing the thought. "Well cut them to imaginary ribbons, Boss." "Better us cutting them into imaginary ribbons than Klingons cutting them into real ribbons, Ken." The cadets ships moved onto the screen, suddenly spotting the Klingon battlecruisers. As expected, they began to assault the largest of the motionless ships. Within moments, they had arrayed themselves around it, trying to hit it with their targeting lasers, with dismal results. Her lips tightening into an almost predatory smile, Uhura peeked over her video display. "Gentlebeings, open fire!" Within moments, the scene shifted. As expected, the cadets began returning fire, forgetting Uhuras ship, then, as Uhuras ship burst into action, the cadets found themselves herded into a defensive position, their backs to Drevan and Tucker. With a whoop of glee, the two beings caused their ships to burst from hiding, deploying their fake firepower on the cadets ships with wild abandon.
" All five beings looked in horror as the ship Uhura had been controlling turned to face the NCC-1701-A and fired disruptors into the saucer section, tearing a huge hole into the superstructure. Before anyone else could react, Uhura triggered the communicator. "Bridge! TSoral, contact the cadets ships and tell them to head for the Hyperion immediately, as fast as they can. Engineering! Indri, weve got problems. One of the ships has gone live and has disruptor capability. What have we got for warp, impulse and phasers?" "Warp and impulse are under repair. Weapon systems are operative, but before you ask, were out of phaser and photon torpedo range." Uhuras face tightened. "Get us mobile, Indri, as quickly as you can. I dont care how you do it." She broke the connection. Three of the four were staring at their screens, aghast, as the Klingon ship turned to face another vessel full of cadets. Only Eletto was working his controls. "Theres no weapons on your ship, Giac. What do you think youre doing?" "We called it running interference in football in my day; these days, I guess youd call it trying to draw fire, Captain." Elettos eyes remained focused on the screen before him as he worked the controls. "Im piloting an automated, unmanned piece of junk. The other pieces of junk have live Humans on them." As he spoke, his ship careened toward the rogue ship, passing between it and the shipload of cadets it was moving after. "My vessel is expendable. Those kids are not. And if Running Bear is hurt, whoever is in that ship is really going to suffer if I can get my hands on them. Thats my shipmate they were shooting at." The rogue vessel tried to target another ship; Eletto interposed his vessel again. "And the old Enterprise, to boot. Someone is going to pay for that, if I have any say in the matter, and pay with their blood." The normally placid physicians face displayed an angry ferocity that surprised the others. "Anyhow, do any of you have a better idea?" Eletto shifted his ship again, sending it spinning as it approached the Klingon vessel. "And if I can keep the attention on my ship, maybe the other cadets and especially Running Bear will have a fighting chance of living long enough to get back to the Hyperion again. If hes still alive." There was a flash, and Elettos ship went inert. "Thats the end of me, anyhow." As if stung by the physicians remarks, Tucker, Drevan and Reichard began to move their ships in a complex pattern, mimicking Elettos tactics, mobbing the rogue battlecruiser like sparrows mobbing an owl. A sharp tone of command entered Uhuras voice. "Eletto, take over for Drevan. I want him at Science Two as fast as possible, and I want a casualty estimate for the NCC-1701-A." Eletto took the controls out of the Andorians hands. Drevan slapped the communicators control patch. "Bridge. Mole, I need the Science Two console on Uhuras little screen down here, fast. How long?" "Forty-five more seconds, Snowdome. Mole out." Before Drevan reached the control area, Uhura saw her display replaced by Science Two console, with control patches in place for him to use the joysticks to run the display. "This isnt possible!" "Um, yeah, better continue believing that, Captain. The nicknames are in house signals to use some of the clandestine stuff we still have. Dont ask." Drevan began operating the Science Two console as he spoke. "Evidence for twelve still alive on the Enterprise. Lets see, there were five on the bridge, counting Aiglekdos; counting Running Bear, seven in Engineering. All accounted for and alive, for the moment." Uhura nodded, appreciatively. Reichard slammed a fist on the table in front of him. "Got me. Im immobile. Giac, Joe, its up to you." "Enterprise looks essentially dead, Captain; only the emergency lighting and turbolifts seem to be functional. The crew must be suited. Theres no sign that theres any power to the impulse drive. Theyre a helpless target." Uhuras eyes tightened to thin slits. "Tucker, keep their attention. Eletto, see if you can ram their impulse drive." "No such luck, Captain." Eletto stood up from his terminal. "Theyve got me again, and I dont see how youre going to last long, Tucker." Blast. Great. Running Bear, youre on your own." Helpless, but fascinated, all five gathered around a single output. Slowly, the battlecruiser turned to the ship that had once been the Enterprise. Almost inaudibly, Uhura whispered, "Running Bear, if any of Scottys soul stuck with yours, nows the time to put it to use." Stepping into what had once been Captain Scotts office had not only triggered a rush of memories, but also a deep sense of awe, almost of reverence. None of the personal touches that had made the office reflect Scottys inimitable personality still remained, but somehow the aura of his immense reputation and his powerful personality remained almost palpable. Running Bear sat down at the system Frensa had cobbled together. It was good work; along with a view of the combat arena, there was a display of all the surfaces of the ship, where hits were probably going to be logged, and there were cutouts to disable almost every subsystem the ship had. The engineer smiled to himself. He hoped the cadets were ready for a rough ride, because he was determined to see that they got it. As expected, the three Klingon ships came into sight and were attacked with predictable, almost chaotic vigor. Running Bear waited patiently, knowing that Eletto and Reichard would attack soon. Elettos first shot hit the Enterprise near the impulse drive area. Running Bear shut the drive down. Despite the loss of the impulse drive, the cadets on the bridge used the orientation thrust to turn to face Eletto and return fire. He looked at the display showing the activity of the cadets: theyd taken the steps that should have returned impulse power, so he restored it, but make them pay for their mobility by making the ships lighting flicker off and on. Cadets were scurrying to try to figure out how to restore stable lighting, and to anticipate whatever bit of mayhem was coming next. Hardly had they restored stable lighting than Drevan and Tucker came out from hiding and hit them square in the dish. That just cost them their shields, I think, Running Bear decided. And one of their targeting lasers, too. Theyre lucky I left them the other. Without warning, the largest of the ships turned to face the NCC-1701-A. This wasnt in the script, the engineer realized. Surely Uhura isnt ad-libbing, is she? I didnt think that was her style. Before he had a chance to answer himself, Running Bear saw disruptor fire leap from the battlecruisers engine-mounted cannons to the ships primary hull, and felt the ship rock. He hit the cutout for the whole ship, then restored the turbolifts before he exploded out of the door of his office. "Into vacuum suits, everyone. Now!" "What happened?" While the others ran to suit up, one cadet stood, almost transfixed with amazement, staring at Running Bear, eyes wide with fear. The helmet of Running Bears vacuum suit snapped into place. "That was real disruptor fire, Cadet, and if that ship has Klingons in it, which it probably does given whats on the scans, their next target is likely to be this deck. Unless youre really good at breathing vacuum, I would very strongly suggest you get your carcass into a suit or the knot-heads in that ship will make sure youre not going to last long enough to be commissioned." While the engineer was speaking, one of the other cadets arrived with a vacuum suit and helped him into it. Running Bear assessed the situation mentally, then acted. "Any of you greenies know anything more than trivia about phasers?" The cadet who had arrived with a suit looked up. Running Bear realized the cadet was a Vulcan female. "I have made a more thorough study of the phaser than I suspect the others here have, but I am lacking in anything but the most rudimentary hands-on experience." "Rudimentary experience probably puts you a parsec ahead of the rest of your fellow cadets." He turned to the other cadets. "Ive cut power to everything but the turbolifts. If we are very, very fortunate, the Klingons will be gullible enough to believe theyve shorted out our power distribution system, and we have a tiny chance of giving them a rude surprise back. If you make the stupid mistake of giving them reason to believe otherwise, I wouldnt count on them being gullible enough to stay fooled for more than about ten seconds. Is our situation reasonably clear to you all?" There was a chorus of variations on "Yes, sir! Perfectly clear, sir!" "Good. This cadet and I are going to see if we can get a phaser bank back into action. When I get back, I expect to see a control system set up in the chief engineers office that will allow me to fly this ship on impulse power. You better work like your lives depend on it, because off hand, Im willing to bet that they do. Understood?" Rather than answer, the cadets began to scurry. Running Bear moved toward the turbolift, the Vulcan in tow. Within moments, they were hurrying through the engineering access corridors towards the phaser array. As they approached it, they saw a lone figure hunched over the least damaged phaser. Despite the hard vacuum, individual must have heard their approach, perhaps through the boots of his suit, because he stood up and faced them. "Either of you have any engineering experience?" "I was one of Montgomery Scotts cadets, sir," Running Bear replied. "Im the one they sent from the Hyperion to replace Frensa. I presume youre Captain Aiglekdos?" "Good guess, kid. Give me that wire, there." Aiglekdos pointed, then reached for a component. Running Bear complied. "You have engineering experience, sir?" "I was training Starfleet engineers how to fix phasers when your father was in training pants, kid. They pulled me out of engineering and made me Captain for this cruise because there were no real captains who would take Kirks seat." Aiglekdos turned to the cadet. "Youre Vulcan?" The captain pointed. "See if you can get that trititanium strut, there. Were going to need it for a lever." He turned to Running Bear. "You, see if you can scrape together enough parts to get some sort of forward shields. The Vulcan and I will get this phaser bank ready to go. You going to be able to restore power?" "I shut it down from Frensas console, Captain." Running Bear looked at the captains face. There was considerable bruising all across it, and one eye was swelling shut rapidly; it was obvious that he had suffered decompression injury. "The cadets on the bridge?" The older man nodded. "Ought to be fine. Soon as we were hit, while the bridge was still losing pressure, I herded em into the turbolift. Didnt quite suit myself up fast enough to avoid a little vacuum injury. I think I was the worst hurt of the bunch. I hope I was, anyhow. Theyll be joining your cadets in Engineering, by now, and will be safer than you are. Now get to the shields, kid. I dont hold out much hope that theres enough left for you to fix, but if Scott trained you, there might just be a tiny shred of hope." Aiglekdos turned back to the Vulcan. "Now you put the end of that bar just here, young lady, and use that bit of wreckage for a fulcrum. Hold it for me, while I get up to the other end and see if I can get this piece of junk aligned with that strut below. I think that strut still points straight forward." Running Bear looked at the shield generators. Despite the severity of the damage, he began sorting through the wreckage, cannibalizing two or three other severely damaged generators, pulling together what he needed for the one he was working with. The result wouldnt take much, but he knew he would manage at least a low power shield. It would be a good deal better than nothing, at least. With the pieces in place, he tapped his suits power supply. A few adjustments to the tuning, and he disconnected the shield generator from his pack and connected it back to the ships power supply. Aiglekdos and TKrill were obviously having less success. Neither being could stabilize the phasers position to the older engineers satisfaction. He turned to Running Bear. "Well?" "One shield generator more or less functional, Captain. I estimate it will give about ten to twelve percent of maximum for not more than thirty minutes before it burns out." "Good work, kid. Take your Vulcan friend back to Engineering with you. Im going to have to use this oversized crowbar to keep the phaser coupler in place. Youve got one shot. After that, its going to fuse. Better make your one shot count." "Im sure we can get it stabilized, Captain," Running Bear started to look at the crumpled supports. "Then we can return together." Aiglekdos grabbed Running Bears shoulder, straightening him up. "Look in front, kid. Only three ships left mobbing the live Klingon battlecruiser. How long do you think they can keep it up? And when the last of those three are gone, guess who eats disruptor fire? There isnt time to play with it any longer. Ill take care of myself. This is the Enterprise, boy, even if shes been relegated to nothing more than a training toy for cadets. What more could this old soldier ask than to go down honorably in battle? Move." Without giving either of them time to answer, Aiglekdos moved to the far end of the trititanium beam and began to push. "I cant hold this thing forever. Ive got a relay rigged here on my wrist to fire this phaser bank on your command. Now git." Reluctantly, but rapidly, Running Bear and TKrill hustled to the turbolift and returned to Engineering. Running Bear ran to Scottys old office. He looked over the circuitry cobbled together on what had once been the chief engineers desk. One cadet was staring at the display showing the status of the ships. "It appears to take a minimum of three minutes for the disruptors on that ship to charge enough to fire, sir, but I wouldnt count on more than two point five. They apparently are unable to charge the launcher on their torpedo tube, or wedve taken a hit by now. Only two of the remote guided ships appear to be left." Running Bear moved the cadet to the side. "Youre the one that came for me in the Ithaca, arent you?" The cadet nodded. "Yes, sir." The engineer looked at the cadet; he obviously had not escaped injury when the saucer had decompressed; he wondered how bad the others were. For the moment, he chose to table the issue. "You dont look space worthy, Cadet. TKrill, can you pilot a shuttle?" "I have some limited experience in doing so, sir." "Good. You pilot the shuttle. All of you get into the shuttle. On my command, TKrill, fly it straight opposite the direction this ship is moving, as fast as shell go. Once the Klingon ship is neutralized, use your own judgment, but you need to get to the Hyperion by whatever means seems prudent." Running Bear turned to a cadet that was still finishing a part of the control system. "Have you got this lash-up rigged to allow me to pick a moving object and have it automatically move the ship towards it?" The cadet pulled out from under the panel he was finishing. "Yes, sir. We figured that youd not be able to cannibalize enough parts to restore automatic targeting for the phasers. The obvious solution was to have it point straight ahead, then orient the ship. I hope you will find it satisfactory." "Good thinking. Now hustle. When Aiglekdos gets back here from the bridge, and Im done with whomever has taken over the Klingon battlecruiser, he and I will take the other shuttle to safety." Running Bear settled behind the controls. "TKrill, youre in control of the rest of them. Get moving." The Vulcan immediately began herding the cadets to the turbolift, leaving Running Bear to his own devices. Helpless, but fascinated, all five gathered around a single output. Slowly, the battlecruiser turned to the ship that had once been the Enterprise. Almost inaudibly, Uhura whispered, "Running Bear, if any of Scottys soul stuck with you, nows the time to put it to use." Suddenly, the remaining navigational lights on the NCC-1701-As dish came on again, and the ship began to rock, then move. Before the Klingon battlecruiser could respond, a lance of phaser fire reached out to the battlecruiser, vaporizing its impulse drive. Drevan moved to the console displaying his science station. The Andorian nodded gently. "Good man, Running Bear. Ships at full power, Captain, and hes got a trace of forward shields." He looked up at the others. "Scotty may be gone, but his spirit seems to have stayed with the ol girl." The distance between the Enterprise and the battlecruiser began to close. Reichard shook his head. "I dont get it. Id be beating a hasty retreat, and leave the Klingon battlecruiser to the Hyperion." Eletto nodded. "Thats the logical thing to do, Ken. Its also what the Klingons probably expect. If that shield of theirs can handle one hit, by the time those disruptors are ready to fire again, they can be way out of range. I hope." True to expectation, a finger of energy leapt from the battlecruisers disruptor canons to the shield on the front of the NCC-1701-A. "The shield handled the disruptor energy, but its blown, now. And the phaser on the old Enterprise looks like its fused into slag." Drevan shook his head. "This is one excellent time to make an escape." Contrary to expectation, the decommissioned Enterprise accelerated toward the battlecruiser, the ragged remains of the saucer section heading for the forward command pod of the Klingon ship. "What is he thinking?" Uhura blurted. "Is he trying to kill himself and a shipload of cadets?" No one else spoke, watching in silent suspense as the ship drew closer and closer to the Klingon battlecruiser.
" The chief science officers voice trailed into silence, leaving the results to everyones imagination. As the decommissioned Enterprise drew nearer and nearer to the battlecruiser, the battlecruiser rocked and rotated, trying to force the collision to be with something other than the bridge. Inexorably, the NCC-1701-A shifted to stay on course. Finally, the inevitable happened: the wreckage of the dish rammed the Klingon ship. "Shuttle exiting, Captain," Drevan grabbed the screen in front of him, as if the sheer force of his grip and encouragement could somehow move the shuttle faster. "Cmon, Running Bear, run. Get out of there before the antimatter containment field goes." Eletto stood up. "Im out of here and heading for the shuttle bay. Im willing to bet there are wounded cadets on the way." He disappeared into the turbolift. Uhura pried herself from the evolving situation on the display and triggered the communicator. "Sickbay! All available personnel to the shuttle bay with full battle casualty preparation. Shuttle presumed to be full of wounded incoming." From her position near the communicator, she could see the sudden flash of light as the display registered the antimatter reacting with the wreckage of the two ships. Her eyes locked with Drevans in silent question. "I dont know, Captain." The Andorian stood. "Not yet. See what you can find on visual. Itll probably clear first." He moved to where he could take his own advice. The display cleared, revealing the shuttlecraft, limping toward the Hyperion. "Shes damaged, Captain, but I think the shuttle will make it." Without replying, Uhura headed for the turbolift. The others followed. Running Bear waited until he was sure that TKrill and the cadets were safely in the Ithaca. He took a deep breath, then restored power to the ship. "Captain, do you read me?" "Loud and clear, kid. Youd better shut up and take action; looks like that battlecruiser is moving to respond." Silently, Running Bear began to operate the controls. Initially, he made a few, purposely random moves, hoping to convince his adversaries that the decommissioned Enterprise was little or no threat. As the battlecruiser began to move into position to fire, Running Bear targeted the impulse deck. His eyes shifted to the clock on the screen; a minute and a half before they would be able to fire. Gently, he adjusted the ships orientation to be sure that the targeting was perfect. "Captain, ready to fire. Let her rip, and get back here." The only response was the screen showing a line of phaser energy striking the impulse drive of the battlecruiser, destroying it. Grimly, Running Bear smiled. There was one more card to play, and he was going to go for broke playing it. The Enterprise didnt turn tail and run from opponents; she met them head on. The disruptor fire from the Klingon battlecruiser hit the NCC-1701-A again, just as Aiglekdos stepped out of the turbolift. "What do you think youre going to do next, kid?" "Got you. Then wed better get out of here. Its going to be ugly when the antimatter containment field goes. Unless you want to go out in one whale of a blaze of glory." "Id rather see that blaze than be in it." Running Bear locked in a last command sequence. "Shuttle bay, Captain. At the run. There isnt much time, and I want to be well away from here when that antimatter goes off." Aiglekdos made no comment. Both men hustled to the shuttle. Reichard, Uhura and Drevan stepped out of the turbolift onto the shuttle deck. MBenga, Davids and Eletto were attending to the cadets, with Webb and the other nurses moving from cadet to cadet doing the same. The remaining cadets were standing, looking on, looking helpless. "Which one of you flew the shuttle here?" Reichard called out. "I did, sir." TKrill stepped forward. "Good job, but get your fellow cadets out of the way, preferably to Sickbay. Theres another shuttle coming, and its not likely to make a soft landing." The deck officer in the control room used tractors beams, shifting the now-empty shuttle to a parking bay at one side of the deck. The sickbay team moved the wounded cadets off the deck as TKrill guided the rest out of the area. Uhura moved quickly to the shuttle bay control area, joining Indri. "How bad, Indri?" Her concern was obvious. "Its going to have to come in on tractors, Captain," the engineers baritone returned. "It looks like shrapnel from the explosion did some major damage." Indris hands began rapidly moving over the controls. His fingers continued their ballet across the surface. The damaged shuttle entered the shuttle bay and was gently deposited on the floor, canting to one side from the damage it had sustained. As the exit deployed, Running Bears head stuck out. "I need some medical assistance in here! Aiglekdos is having trouble, and Im not sure I can move him safely." Davids came across the bay at a run, Webb not far behind, both making their way into the shuttle. Between them, Running Bear and the other two gently eased Aiglekdos onto the deck. "He was on the bridge when it decompressed, Hardav," Running Bear offered. "Hes been getting worse since." The PA stared at his mediscanner, his face grim. "Theres more to this than just decompression. Captain Aiglekdos?" "Harrison Davids, Physicians Assistant, Captain." "Lose the labels, and give me something for the pain, will you? Youre not going to be able to do anything else for me." As Hardav applied the hypospray to a patch of exposed skin on Aiglekdoss neck, MBenga arrived on the scene. He brought his scanner into play. "Hes got Malgrehns Syndrome on top of his decompression sickness, Davids." MBenga turned to Aiglekdos. "You got your wish, Professor Dim. You always wanted to be a starship captain." "Yep, got my wish, Keme. Had to fight like a fiend to get it, too. Called in every favor anybody and everybody owed me to get Scotts baby." Aiglekdos coughed, bringing up a little blood. "How bads the bleeding into my lungs?" "All accounted for, Captain. Theyll all be fine in a day or so." "Gone, Dim; vaporized when the NCC-1701-As antimatter reacted." The swollen, discolored face smiled weakly. "Victorious?" "You won, Captain. Your victory was complete." MBengas hypospray hissed against Aiglekdos neck again. "You know this man, Doctor MBenga?" The Zulu turned to face Uhura. "I knew him, yes. From Starfleet Academy, actually. He was one of the most dreaded and loved professors on campus." He turned to face Aiglekdos. "Werent you?" "And proud of it, too. Montgomery Scott and I terrorized em for years until he got on the Enterprise." Aiglekdos face tightened in pain despite the medication. "Even as a trainer, the old Enterprise had one more victory in her. You tell those cadets they did well for me, will you, Keme? And make sure that kid you sent over knows I said he was a champion." Running Bear knelt beside Aiglekdos, leaning forward into Aiglekdos field of vision, his twin braids falling forward. "Ill tell the cadets myself, Captain. And thank you. An old soldier cant ask for anything better than to die in battle, victorious. You got your wish, didnt you? "Here he lies where he longed to be. Aiglekdos looked Running Bear in the eyes, struggling to breathe. He tried to speak, but couldnt quite manage it. Gently, almost reverently, Running Bear lifted Aiglekdos up a little bit. Aiglekdos smiled weakly, "Stevenson, Requiem. Scott mustve squealed on me. Earlier line fits me, now: And I lay me down with a will." He coughed again, more violently than before, this time bringing up blood. His head lolled limply to one side. The Bantu knelt at Aiglekdos side, gently closing his eyes. "No need to ask, Keme. With full military honors. He deserves it." Here he lies where he longed to be.